The Mouse, The Bird, and the Sausage was published in Grimm's Household Tales , edited and translated by Marian Edwardes, 1912 edition. Once on a time a mouse, a bird, and a sausage became companions, kept house together, lived well and happily with each other, and wonderfully increased their possessions. The bird's work was to fly every day into the forest and bring back wood. The mouse had to carry water, light the fire, and lay the table, but the sausage had to cook. He who is too well off is always longing for something new. One day, therefore, the bird met with another bird, on the way, to whom it related its excellent circumstances and boasted of them. The other bird, however, called it a poor simpleton for his hard work, but said that the two at home had good times. For when the mouse had made her fire and carried her water, she went into her little room to rest until they called her to lay the table. The sausage stayed by the pot, saw that the food was cooking well, and, when it was nearly time for dinner, it rolled itself once or twice through the broth or vegetables and then they were buttered, salted, and ready. When the bird came home and laid his burden down, they sat down to dinner, and after they had had their meal, they slept their fill till next morning, and that was a splendid life. Next day the bird, prompted by the other bird, would go no more into the wood, saying that he had been servant long enough, and had been made a fool of by them, and that they must change about for once, and try to arrange it in another way. And, though the mouse and the sausage also begged most earnestly, the bird would have his way, and said it must be tried. They cast lots about it, and the lot fell on the sausage who was to carry wood, the mouse became cook, and the bird was to fetch water. What happened? The little sausage went out towards the wood, the little bird lighted the fire, the mouse stayed by the pot and waited alone until little sausage came home and brought wood for next day. But the little sausage stayed so long on the road that they both feared something was amiss, and the bird flew out a little way in the air to meet it. Not far off, however, it met a dog on the road who had fallen on the poor sausage as lawful booty, and had seized and swallowed it. The bird charged the dog with an act of barefaced robbery, but it was in vain to speak, for the dog said he had found forged letters on the sausage, on which account its life was forfeited to him. The bird sadly took up the wood, flew home, and related what he had seen and heard. They were much troubled, but agreed to do their best and remain together. 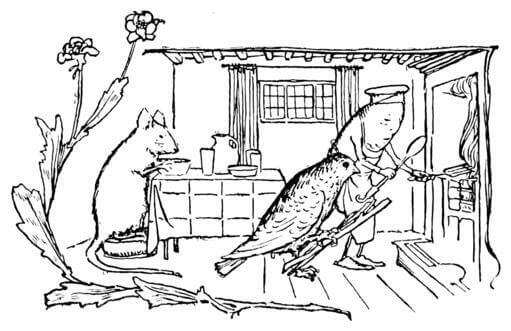 The bird therefore laid the cloth, and the mouse made ready the food, and wanted to dress it, and to get into the pot as the sausage used to do, and roll and creep amongst the vegetables to mix them; but before she got into the midst of them she was stopped, and lost her skin and hair and life in the attempt. When the bird came to carry up the dinner, no cook was there. In its distress the bird threw the wood here and there, called and searched, but no cook was to be found! Owing to his carelessness the wood caught fire, so that a conflagration ensued, the bird hastened to fetch water, and then the bucket dropped from his claws into the well, and he fell down with it, and could not recover himself, but had to drown there. Add The Mouse, the Bird, and the Sausage to your own personal library.